In our previous blog, we discussed some different business cases for financial institutions that might use their KYC processes to generate revenue. With a imaginary example, set in the year 2020, we highlighted the benefits of improving your customer experience. In this blog, we’ll take this one step further. 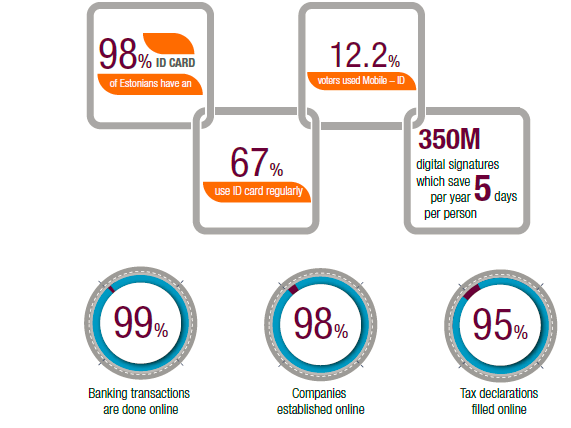 We would like to mention Estonia as a great example of an advanced system which enables banks to authenticate people without physical contact: e-identity. Unlike many other citizens, every Estonian, irrespective of their location, has a state-issued digital identity. Thanks to this, Estonia is years ahead of countries still trying to work out how to authenticate people efficiently and without physical contact. The EU considers the Estonian approach as a pathfinder which allows efficient, secure and transparent identification of a person saves time and money for many third parties (including banks). Let us explain how it works in practice. 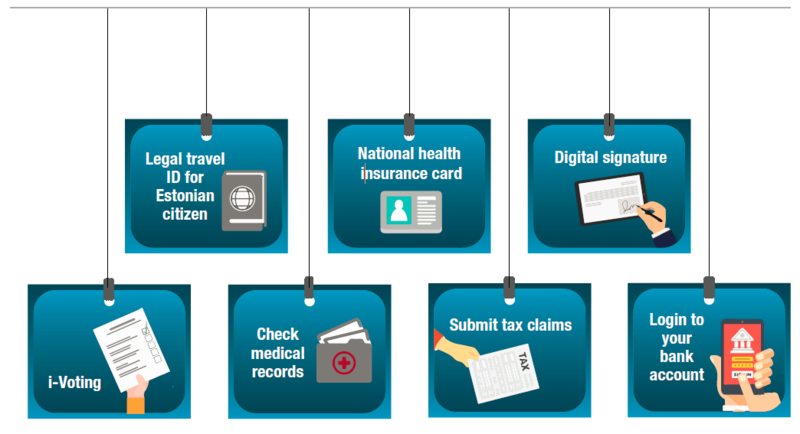 The Estonian government developed a mandatory ID card, which, besides the simple identification of a person, provides access to secure e-services. The special chip in the card provides definite proof of ID in an electronic environment. As a result, people and companies can save time on unnecessary security checks. More people are switching completely to smartphones, so what about having the same functionality on your phone? This is obviously covered as well by a service called Mobile – ID. It allows people to use a mobile phone as a secure digital ID. Just like ID card, it would enable you to access secure e-services, digitally sign documents and does not require any code generation or card reader. All you need is a smartphone! Isn’t that how future should look like? The system is based on a special Mobile ID SIM card, which the customer has to request from a mobile phone operator. It’s highly beneficial for the banks to encourage the Estonian population to use their services online because it is a safe, secure, 24/7 environment which requires limited headcount on the bank’s side. The customer journey of KYC process is remarkably improved when your customer can identify himself by using a secure e-identity, sign all required contacts etc. As a result, it takes for instance only 18 minutes to establish a company in Estonia! So can you imagine how fast you could open a bank account? Once PSD2 APIs are available it could be done in a second as all the data is there. We believe that in the near future the integration between European countries will increase and identification will no longer be a national task but governed by a supranational body. Every person will be able to decide which party has access to which information, similarly as it is nowadays with the prompts on what kind of information is used by which application on the phone. There will be one national ID card linked to a secondary device. One is used as a “hard key” whereas the second one is transferable via software. The combination of these two will allow the identification and verification of information. This information will be stored in a distributed ledger like the nowadays employed X-Road (used by Estonia and Finland). Individuals will be able to access all data stored about them and all queries that are done on that data and give or take away permissions on certain information. No one wants to run around with multiple credit and debit cards, five different loyalty program cards, a driver’s license and the library card. All information will be stored securely and accessed on demand. No one wants to provide identifications, letters as proof of address and physical documents from municipalities in order to open up a bank account. The identification and verification will be done once and shared with other banks/institutions. Customers within the EU become more mobile therefore will not understand why there are easy processes in one country and cumbersome processes in others. As all successful business and financial institutions know – user experience plays a major part in retaining their customers. Taking into account all open banking initiatives currently ongoing in the market banking is becoming more mobile, digital and competitive as a result customers will become even more mobile. This means it will be easier for them to switch providers and the transition barriers currently in place will crumble. Our message here is clear: To stay competitive in the market banks must make sure they are able to please their customer – starting with KYC process. The banks must find innovative and standardized ways to provide superior services with smooth and easy user experience. In our opinion this can only be achieved with digitalization via various open banking initiatives. If you wish to further exchange on this matter, feel free to reach out to us: Arune Aleksonyte and Martin Alexander Mühlmann. Arune Aleksonyte is part of the Digital Finance Transformation Team within Capgemini Consulting. She has more than 7 years’ of experience in financial services and consulting. Arune advises clients on agile project management, IT & digitization strategies within finance, risk & compliance domain.